Thanks to a quick-thinking good samaritan with binoculars, two men and a dog were rescued from Boston Harbor after capsizing a kayak launched from Carson Beach. BPD Harbor Unit responded and rescued two males and one dog from a buoy. The men were taken to an area hospital. Unfortunately, the dog did not make it. 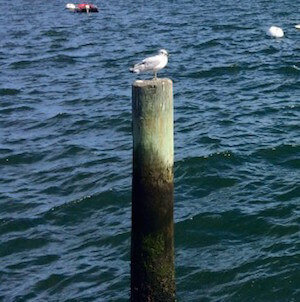 At about 6:15PM on Saturday, March 30, 2019, officers assigned to the Boston Police Harbor Unit, while patrolling Boston’s Inner Harbor in the Long Wharf area, responded to a radio broadcast from the United States Coast Guard for two people in the water hanging onto a buoy in the vicinity of Thompson Island. Officers arrived on scene, observed the victims, and due to a strong south west wind, officers were able to bring the vessel close enough to rescue both adult male victims and one dog from the buoy. Victims had launched their kayak from Carson Beach in South Boston and paddled out into Dorchester Bay when strong winds and choppy seas became overwhelming. As they turned to head back, the kayak began to take on water, capsized, and sank, forcing the victims into the frigid 40-degree water. They were able to climb on top of the buoy where they spent more than an hour waiting for help to arrive. Victims were transported to Boston Police Harbor Unit Base where they were met by Boston EMS and taken to a local area hospital suffering from severe hypothermia. Unfortunately, the victims dog did not survive and officers transported him to Angel Memorial Hospital. Thanks to the Good Samaritan that was on a tour of the JFK Library who contacted the United States Coast Guard when they happened to look through a pair of binoculars and observed the two victims in distress holding onto the buoy.